Rufus (yes, that's really him) and Martha. Photograph by Chad Batka. Forget jingles piped through department store speakers and imagine experiencing the holidays in a musical family—and by musical we mean your parents are singer-songwriters Loudon Wainwright and Kate McGarrigle. 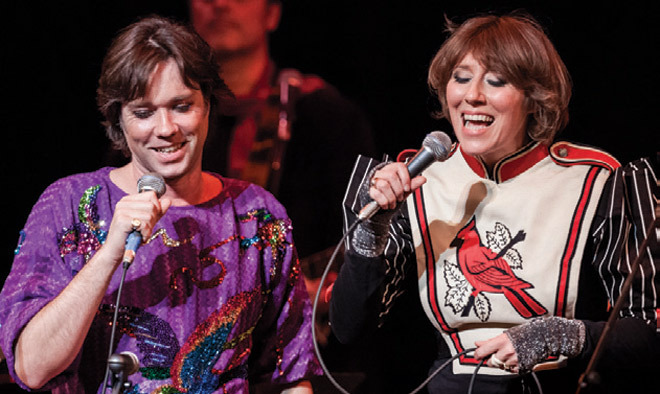 Their children, torchy pop star Rufus and folksy singer Martha, headline Royce Hall on Friday and Saturday night (Dec. 21-22) in a show that recalls the idyllic holidays of their childhood. Mom so loved these sing-alongs that in 2005 the family began a concert tour; since her death two years ago, the kids have taken over. “We’re like a band of traveling Gypsies,” Rufus says of the multitude of scattered relatives who participate (though Loudon won’t be present this year). “Doing shows is an excuse to see each other.” And to invite friends like Emmylou Harris, Van Dyke Parks, and Carrie Fisher. The Wainwright siblings plan on sticking around L.A. for the holidays, too. “We’re going to find a big house and make Christmas dinner there,” says Martha. There won’t be snow, but it’s an opportunity to forge traditions of their own. Previous articleCityDig: A Snowstorm in Los Angeles? It’s Happened.